Miles Wood’s season got off to a bit of a rough start. He was a healthy scratch in the team’s 4-1 victory against the Colorado Avalanche in their season opener. He had shown flashes of brilliance as a rookie, so there’s no doubt it came as a disappointment. Nevertheless, it didn’t deter him, “It’s been everything. It’s been my fuel to the fire the past two games here,” Wood said after a 6-3 victory over the Maple Leafs on Oct. 12 in which he scored two goals. Since then, he hasn’t looked back and has put together a rather impactful sophomore season. Wood’s best attributes are apparent when you watch him play. He’s one of the fastest skaters on the Devils, arguably just behind Taylor Hall. He also has the size to add a physical presence and is a nightmare for opposing goalies in their crease. With 14 goals and eight assists in 50 games, his point totals might not seem overly impressive. However, there’s more than meets the eye. As shown, the Devils have fared quite well when Wood is on the ice. He’s in the top 10 in every category listed above and is close to cracking the top five in a few cases. He also finds himself ahead of some of the team’s more household names. For example, his points/60 ranks higher than Jesper Bratt’s and Kyle Palmieri’s. His Rel CF% is also greater than Nico Hischier’s and Travis Zajac’s. Those numbers are in stark contrast to where Wood was last season. His CF% and xGF% are about 9 percent and 7 percent higher while his production has jumped from 1.09 points/60 to 1.98. A crucial part of a young player’s development is the ability to show improvement from season to season, and so far, he’s displayed it. Related: Devils Key Piece on Defense? After spending most of his rookie season as a fourth liner, Wood has seen his role elevated, even including top-six minutes. That’s especially true over the last few weeks where he’s found himself with Kyle Palmieri and Pavel Zacha. If it weren’t for his improved play, he wouldn’t have the opportunity that he does, and Zacha has taken notice. While Wood’s blazing speed is a big factor for his breakaway goals, it isn’t the sole reason he’s with Palmieri and Zacha. By and large, they have consistently put their opponents on their heels when on the ice. In 47:52 minutes together at five-on-five, they have a robust 62.3 CF% and have out-chanced their opponents by a margin of 31-19. Granted, it is a rather small sample size. Even so, their numbers are rather impressive and it is something to build on going forward. 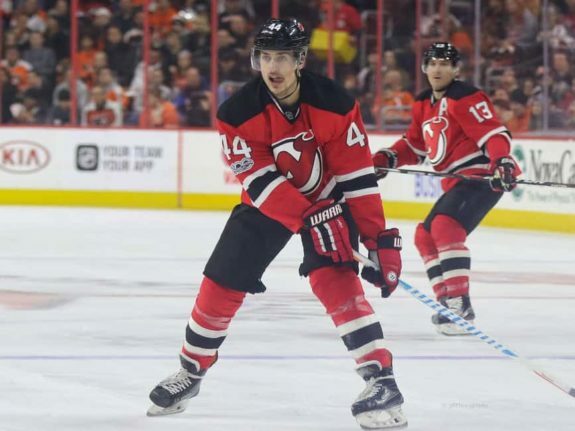 With injuries hampering the team up front throughout the season, the Devils have been searching for a consistent second line. With Wood, Zacha, and Palmieri, they seem to have the making of what is a very formidable trio. If they can continue dominating the opposition while giving the line of Hall/Hischier/Bratt some relief, it’ll only be of benefit to the Devils. Surprisingly, none of Wood’s 14 goals have been game-winners. Even though that’s the case, it doesn’t mean the Devils aren’t coming out on top when he scores. In games where he’s tallied at least one goal, they’ve compiled a 6-2-2 record. Although he may not be the go-to-guy, he still plays an integral role for the Devils. Secondary scoring is an important part of sustaining success in the NHL. While they had gotten that earlier this season, it has cooled off quite a bit and is part of the reason behind their woes in January. Even with other role players coming back down to Earth, Wood has maintained his steady scoring pace. At the start of the season, he seemed like an unlikely source of offensive output, but at his current rate, he’s projected to finish with 23 goals. That would be second-highest on the team behind Taylor Hall, who’s on pace for 30. At 109 shots on goal, Wood ranks third on the team. If he continues shooting the puck, that 23-goal target seems achievable and with 31 games remaining, he only needs 9 to do so. With the Metropolitan Division looking to be a flat-out brawl over the final weeks of the season, the Devils will need Wood to keep finding the back of the net. He’s shown great improvement and needs to continue to do so down the stretch. If he can keep contributing as a second-line winger while Marcus Johansson recovers from a concussion, it strengthens the team’s depth and further signifies his importance to the Devils.